Mary Jenkin – a “Bible woman of the Penzance Town mission” – was called as a witness to events on this day. The account below gives her testimony a ‘voice’. I have been working for some time with the Mission, trotting down to the Quay with what help the Lord affords me to give. For some, tracts. For some, wholesome food. And for some, an urgent call for a medical man. So I know the Yates family. Know them all too well, Charlie and Edith and the children. 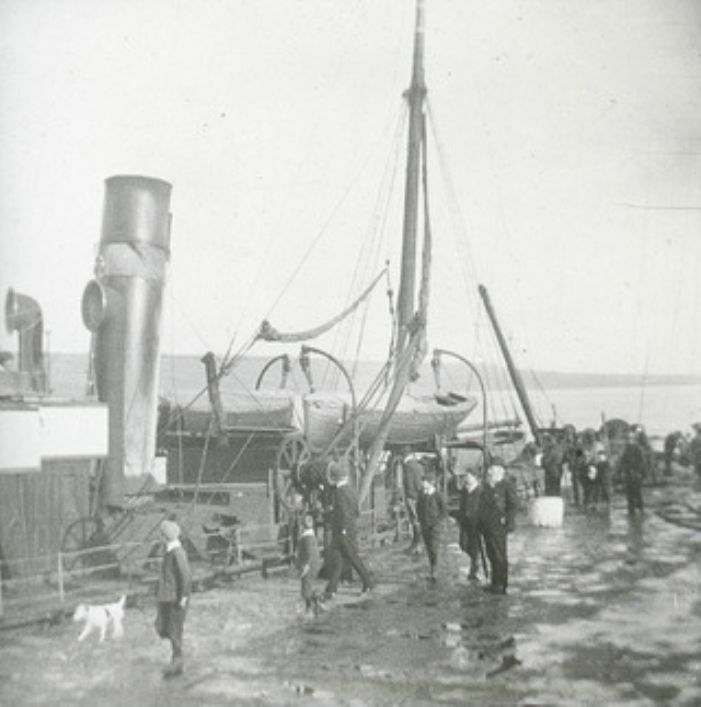 Charlie away at sea, stoker on one of the steamers. Hard work, I’m sure, and after a full day of labour a man needs comfort and recreation: a clean house, dinner on the table. Not broken windows, borrowed sheets, and no washing up done unless the husband’s sister takes matters in hand. It is true that in the past I had found Edith “so impudent” that I “had resolved not to call on her again”. But then I was invited in, and of course faced with a sick child… well, it is not for us to judge. Yes, I relented. At times Charlie’s a bit too ready with his fists when he’s home. But that’s what folk are like down there. Rough and ready. I would have to say that he’s driven to it. His heart’s in the right place, and he’s a fair man. Brings in 28 shillings a week and hands a full pound of that straight to Edith. Only keeps eight shillings back for himself, for the things a man needs. But let me not beat about the bush. You wish to hear about how poor little Bessie was called from this Vale of Tears this evening. Charlie had to go up to Bristol today, never, I’m sure, imagining that he had seen the last of his daughter on this earth, although he knew full well that the child was “in a low state”. Kept saying how she’d been perfectly well a week ago, when he’d taken her to Quay Fair. He’s been in and out of the house all weekend, despite his work duties - popping over to the dock to check the banked fires in the boiler-room of the steamer, then back home to see to things there. He asked his sister to come in and help. He’s a proud man, and was ashamed of the goings-on:– wife in and out of the Ship Inn all day, and likely as not slumped in a chair, dead drunk, when she was home. He said “it was disgraceful to be seen in that state by a doctor”, but he sent for one anyway. 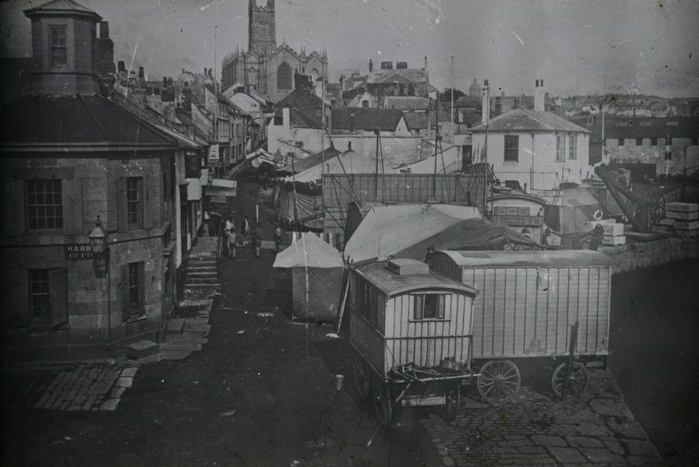 Penzance Quay Fair, where Bessie Yates went with her Dad, Charlie, shortly before she died. On Saturday, he said he “was not going to leave his child there to perish” while they waited for Dr Couch to show his face, and fetched Dr Fox. Doctor comes, and the mother still in drink. His instructions are to give the child milk, “soak its feet in hot water and a little mustard, give it a dose of castor-oil”. “Congestion of the lungs”, he said. In the meantime, he’d send some medicine. Well, the medicine arrived, but today I could see that the bottles were all started, but all still near-full. As soon as I saw the child this evening, I could see that another call from a medical man was most urgently needed. Edith had been “soaking herself in drink” again, and the patient – little Bessie “speechless, convulsed, its eyes glazed… filthy… wrapped in an old shawl… and lying on the table”. I feared infection – how could I clean the child? I had other calls to make. And when I took it upon myself to go back to Doctor Fox for his help and guidance, he threw up his hands and said he could do nothing if his instructions weren’t complied with. The neighbours? They only came in to gawp. In the end, it was left for me to fetch a policeman in and run for Doctor Couch. I keep thinking about poor Charlie. This morning, when the steamer left for Bristol, the man will have been in despair. He’d told Edith straight, that he wouldn’t allow either of the children to stay in such a “pig-sty” – that he’d have them “taken away”. You’ll have noticed Edith’s black eye. I’ve heard that he “gave his wife a clout… but not about the child”. What about, then? Well, when a woman allows herself to get into that state, who knows. And then Charlie was off - up to town to buy a new shirt, as there’s been no washing done, and then back on board. And that’s the last he’ll see or hear of his family until he gets to Bristol, very soon now I would imagine. And there’ll be a telegram waiting. At the inquest the Borough Coroner , Mr G Bodilly, would describe this as “one of the most melancholy stories he ever heard in his life”. The story genuinely shocked the town, and the extensive publicity helped to speed the purchase and demolition of over-crowded ‘slum’ properties in the Quay area. The Yates family lived in Hampton's Court. Although charged with manslaughter, Edith Yates was acquitted on grounds of insufficient evidence.